The Future of the Global Muslim Population, a recent report by the Pew Research Center’s Forum on Religion & Public Life, finds that the world’s Muslim population is expected to increase by about 35% in the next 20 years, rising from 1.6 billion in 2010 to 2.2 billion by 2030. Explore the report using the resources below. Full Report Read through the preface, executive summary, report chapters and appendices. Interactive Maps Select a country, a region or the world – as well as a point in time – and see the size of the Muslim population in that place and time. Sortable Data Tables View and sort countries by the size of their Muslim population and by Muslim population growth. Press Release Read the Jan. 27, 2011, press release. 2009 Report An October 2009 report, Mapping the Global Muslim Population, offers fully sourced 2009 estimates of the size and distribution of the worldwide Muslim population, including sectarian identity. Pew Forum experts discussed the findings from the report during a Jan. 27, 2011, conference call. Listen to audio from the call. Alan Cooperman, associate director for research at the Pew Forum on Religion & Public Life, gave a summary of the findings of the report at a Jan. 28, 2011, State Department briefing. Download the graphics and charts created for this report in a .zip file. A new report forecasts that the number of Muslims around the world will grow over the next 20 years at twice the rate of non-Muslims, but that the rapid growth will level off. The world’s Muslim population will grow at double the rate of non-Muslims over the next 20 years, according to a broad new demographic analysis that is likely to spark controversy in Europe and the United States. Are Muslims taking over the world, or at a minimum, transforming Europe into Eurabia? Whatever your hopes or fears for the future of the world’s religions, a report published this week has plenty to stoke them. “The Future of the Global Muslim Population”, produced by the Pew Research Centre, a non-profit outfit based in Washington, DC, reckons Muslim numbers will soar from 1.6 billion in 2010 to 2.2 billion by 2030. In other words, from 23.4% to 26.4% of the global total. The global Muslim population will grow twice as fast as the non-Muslim population over the next 20 years, according to a report from the Pew Research Center and the John Templeton Foundation published on Thursday. 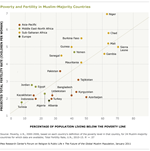 During the same time period, the American Muslim population will more than double. How do demographers come up with these numbers? Twenty years ago, the world had about 1.1 billion Muslims. Twenty years from now, it will have about twice as many – and they’ll represent more than a quarter of all people on earth, according to a new study released Thursday. The global number of Muslims is expected to jump 35 percent in the next 20 years, growing twice as fast as the non-Muslim population, according to a study published today. But Muslims are multiplying at a slower pace than before, and their numbers are expected to level out in the coming decades. A major research institute in Washington, DC, is predicting that the global Muslim population will grow by more than a third over the next two decades – with significant increases in Europe and the United States. However, it also expects that the overall rate of growth will begin to slow down. Reuters: Will Pew Muslim birth rate study finally silence the “Eurabia” claim? A Pew Research Center projection sees the American Muslim population doubling from 2.6 million to 6.2 million in 20 years. Globally, the Muslim population will rise to 2.2 billion, more than a quarter of the world’s population. The U.S. Muslim population is expected to double over the next 20 years, fueled by immigration and higher-than-average fertility rates, according to a new report released Thursday. Assistant journalism professor Nabil Echchaibi knew he was a pioneering researcher, but he didn’t realize just how virgin the territory was until he and a team of University of Colorado students began exploring Rocky Mountain Muslim communities. A study carried out in the United States shows that the Muslim population in Nigeria is projected to increase by more than 50 per cent in the next 20 years, from about 76 million in 2010 to about 117 million in 2030. CNN’s Richard Greene takes a look at how the global Muslim population is expected to nearly double by 2030. Muslims will be more than one-quarter of the Earth’s population by 2030, according to a study released today. Comedian Dean Obeidallah speaks on CNN about the growing worldwide Muslim population. The U.S. Muslim population will more than double in the next two decades, and Muslims will make up more than one-fourth of all people worldwide by the year 2030. A new Pew Research study claims the Muslim population in the U.S. will more than double over the next two decades. Should the West cry foul over a growing number of Muslims? 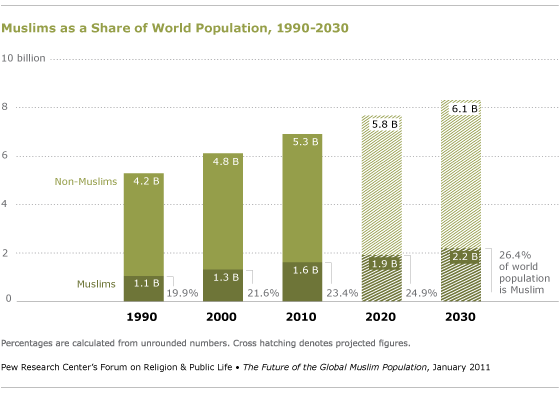 Recent data show that in the U.S. alone, the Muslim population will double by 2030.